Welcome to the MSAG Best Practice Guidance notes! Don’t miss the Species Identification Guide to aid those collecting propagation material while willows and birches are leafless. Guidance note 2 relied heavily on the experience of staff at Trees for Life, Eadha Enterprises, Forest Enterprise Scotland, The National Trust for Scotland Ben Lawers NNR and Natacha Frachon at the Royal Botanic Gardens Edinburgh (RBGE). We are also very grateful for comments on genetic conservation from Prof Pete Hollingsworth at RBGE, and Dr. Gemma Beatty at Aberyswyth University. 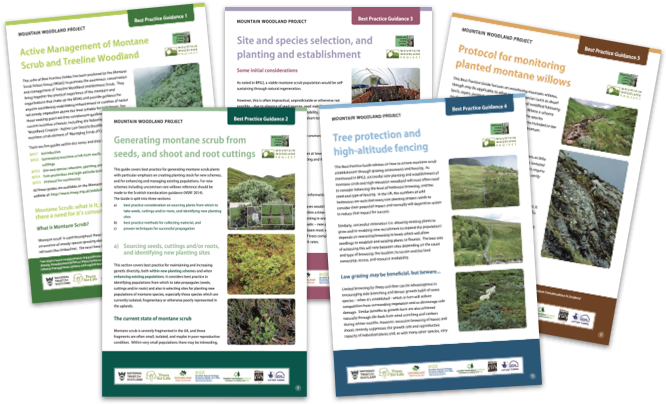 Guidance Note 3 relied heavily on the experience of staff at Trees for Life, Forest Enterprise Scotland, National Trust for Scotland Ben Lawers NNR. Guidance Note 4 relied very heavily on the extensive experience of staff at National Trust for Scotland Ben Lawers NNR, as well as on collated experience pulled together in 2002 by Vyv Woodgee. Guidance Note 5 relied on the experience of members of the Woolly Willow Species Action Group, mainly Richard Marriott. BPG 2: David Mardon, Diana Gilbert, Eadha Enterprises, National Trust for Scotland Ben Lawers NNR, Trees for Life. BPG 3: David Mardon, Diana Gilbert, Emily Hesling, Forest Enterprise Scotland, Trees for Life. BPG 4: David Hetherington (CNPA), David Mardon, Diana Gilbert, National Trust for Scotland Ben Lawers NNR. BPG 5: David Mardon, Diana Gilbert. The MSAG are very grateful to Highland Birchwoods and the Heritage Lottery Fund for providing the resources to produce the BPGs through the Mountain Woodland Project. The BPGs were edited and produced by Diana Gilbert and Phil Baarda, with layout and design by Iain Sarjeant.